[Jesus said,] "I tell you the truth, unless a kernel of wheat is planted in the soil and dies, it remains alone. But its death will produce many new kernels — a plentiful harvest of new lives. Those who love their life in this world will lose it. Those who care nothing for their life in this world will keep it for eternity. Anyone who wants to serve me must follow me, because my servants must be where I am. And the Father will honor anyone who serves me." We try to do so much of what we want to do for God by ourselves. Our motives are right. Our hearts are right. Our plans are made with prayer. The problem is that we sometimes end up doing everything except the crucial thing: We are not willing to die. Our identity gets involved in pulling off our plans. Our hopes and our feelings about Christian service get tangled up in the success of our plans. Jesus reminds us that there is no harvest without death — the seed has to be planted and die before it can germinate and grow. Jesus submitted everything, including his fears and his friends, to the will of God. It cost him his life. It won him the harvest. What have you not surrendered to God? Why? Forgive me, Father. I confess that I have wanted my discipleship and my ministry to be done my way. I want to die to my will and have your will come to life in me. 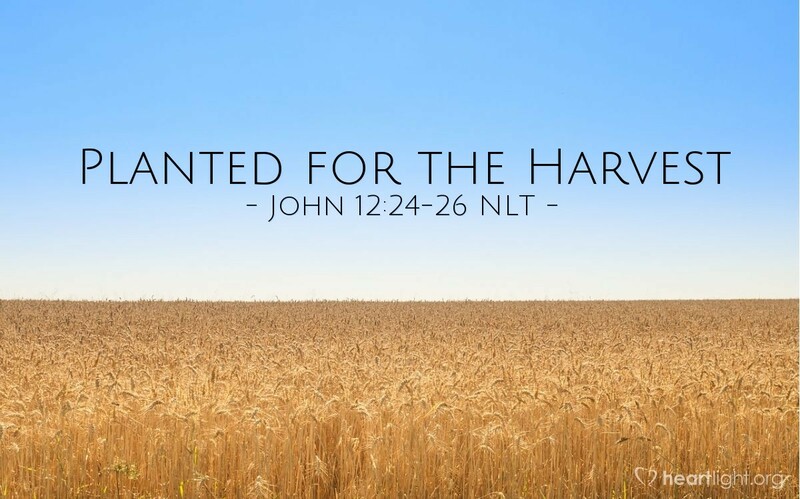 Please show me how to do that because I want to be an agent of your great harvest. In the name of your submissive and triumphant Son, Jesus. Amen.